Disney Art of Animation Resort is the newest addition to the Disney World value resorts. When it opens in 2012 it will offer almost 2,000 new Disney World Resort hotel rooms. 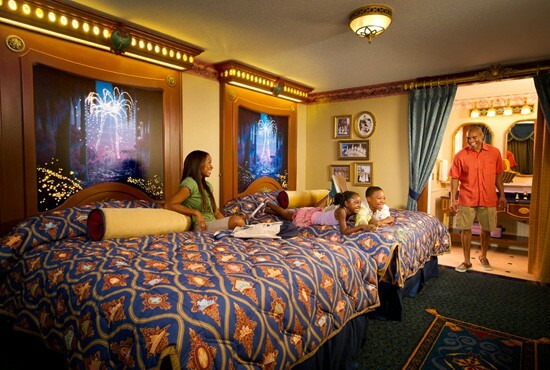 Disney has shown it’s commitment to offering excellent value hotel rooms which are designed to appeal to families. There will be 1,120 suites and 864 standard rooms. The Disney Art of Animation resort is a great choice for larger families and is now available to book for 2012. Disney’s Art of Animation Resort will have almost 2,000 rooms. Guests can choose from standard rooms or opt for the larger suites which sleep up to 6. The suites offer a great opportuity for larger families to have more space in a value resort. 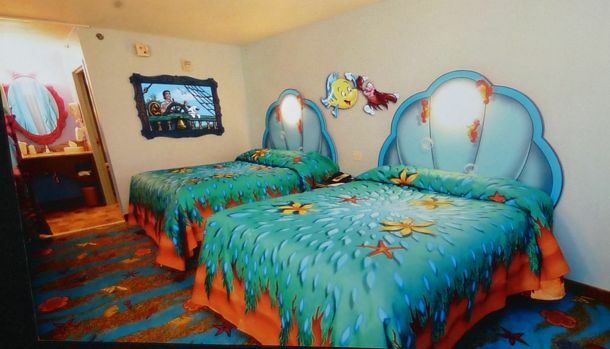 The standard rooms will sleep up to 4 guests and have a Little Mermaid theme. Following on from the success of the Pirate Themed Rooms at Disney’s Caribbean Beach Resort these rooms will likely prove very popular because of the attention to detail of the theme. They are 260 square feet so adequate for a family of 2 adults and up to 2 children. The rooms will be of the same basic design as the other Disney value resorts with a tub, shower and toilet in the bathroom. You can rent a mini refrigerator for $10 a day. Prices for the Art of Animation standard rooms start at $94 per night for a Regular Season weekday night rising up to $179 per night. There are standard prefered rooms available – these are exactly the same design but are located closer to the pools and parking. The additional cost is around $10 a night. The Art of Animation Family Suites are likely to prove very popular. They sleep up to 6 guests and have 520 square feet of space. The suites have a master bedroom with a double bed. There is a separate living room with a double sofa bed and single couch bed. The suites also have the advantage of 2 bathrooms and a small kitchenette. The theme of the suite will depend upon which area of the resort it is located in – either Finding Nemo, Disney Pixar Cars and The Lion King. Rates for 2012 for Art of Animation Family Suites start at $248 and range up to $425 per room per night for the Holiday Season. Which will be the best rooms at the Art of Animation Resort? All of the layouts of the rooms and suites will be identical, so it will be the location on the resort which will be important. Some like rooms closer to the central building and the parking lot. The resort is huge so there will be quite a bit of walking involved so if this is important to you then request a room closest to the bus stop or the pool. Remember that the prefered rooms will carry a $10 premium so think carefully about your choice. Sepcific details have not yet been announced but the Art of Animation will follow the usual Disney value resort design and have a large food court in the main building. Not having a full service restaurant on site is of course one of the downsides of the value resorts, but if you are going to spend most of your time in the parks anyway most guests do not find this to be a problem. If guests are staying with a Disney World Package which includes dining this is a place where they can use counter service and snack credits. There will be 3 swimming pools at the resort. The largest is the Finding Nemo themed pool which is named The Big Blue Pool. This is located directly behind the main building and is of course in the Finding Nemo area of the resort. There are 2 additional pools. The Cozy Cone is in the Cars section of the resort and the Flippin Fins Pool which is in The Little Mermaid section. These 2 pools are designed to be the quieter pools with The Big Blue Pool being the major attraction. The resort is located in the same area as the All Star and Pop Century Resorts. It is closest to Blizzard Beach water park and ESPN Wide World of Sports. All Disney parks and Downtown Disney can easily be reached by using the Disney bus transportation system. The value resorts and the least centrally located of the Disney hotels (with the exception of Disney’s Animal Kingdom Resort) but the transport system is effiecient, quick and free to resort guests. Why Should I Stay At Disney Art of Animation Resort? The Art of Animation is of course the newest Walt Disney World hotel resort available. It has all the benefits of staying in a Disney resort for a very reasonable rate for the standard rooms. The family suites will of course offer larger accommdation for families. Some do feel that the room rates for the family suites are pitched a little high. Whilst at the moment all we have is concept art I am sure that the reality of the design will be amazing and Art of Animation rooms and suites will be in high demand. 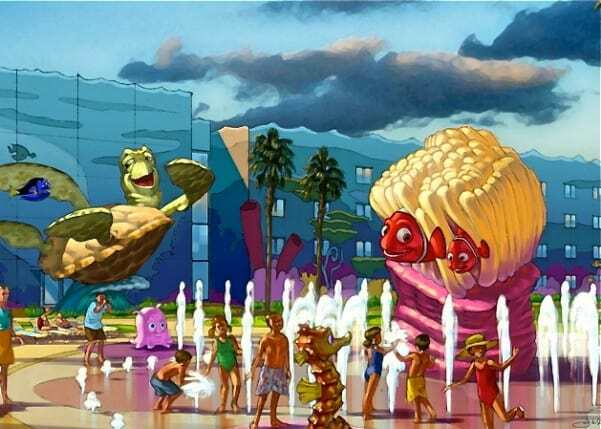 The value resorts are always popular and it is likely that the Animation Resort will take this to an even higher level – the theming is based on the very popular Disney movies of recent times, and so more guests can relate to it. If you want to book a room at the Animation Resort you can do this now for 2012.